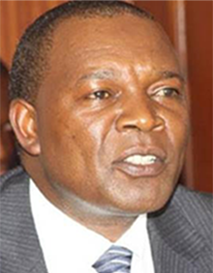 Professor Njuguna S. Ndung’u is the former Governor of the Central Bank of Kenya, a position he occupied for two consecutive four-year terms, from March 2007 until March 2015. He is an economist, a university professor and a researcher. Prior to his appointment as Governor, he was the Director of Training at the African Economic Research Consortium (AERC), a pan African premier capacity building network. He also worked as a regional programme specialist for the Eastern and Southern Africa Regional Office, Nairobi, of the International Development Research Centre, Canada and at the Kenya Institute for Public Policy Research and Analysis as a principal analyst/researcher and head of the Macroeconomic and Economic Modelling Division. He led a team to develop the Kenyan micromodel that has been in use for forecasting growth and fiscal stance since 2001. As Governor, he worked with various global networks. He was Chair of the Alliance for Financial Inclusion (AFI) in the first four formative years between 2009 and 2012. AFI is a network that develops and encourages its members to adopt financial inclusion policies that work, coordinating financial inclusion solutions in Africa, Asia and Latin America. AFI has been described as a ‘clearing house’ for policy solutions that have worked and can be replicated with ease in other countries for financial inclusion. Prof. Ndung’u also chaired the African Mobile Phone Financial Services Policy Initiative (AMPI), a sub-network of AFI that promotes financial inclusion in Africa via the mobile phone financial services. He has lectured in advanced economic theory and econometrics at the University of Nairobi. In addition, he has published widely in international journals as well as chapters in various books on economic policy issues. Currently he is a Member of the Brookings Africa Growth Initiative (AGI) Distinguished Advisory Group, and a Member of the Advisory Committee of the Alliance for Financial Inclusion.